Insurance – in particular, life insurance– makes us think about things we would rather not consider. For those who have families and/or dependents, it makes a lot of sense to consider taking out a life insurance policy. Life insurance can give you reassurance that your family will be safe in case anything happens to you, In addition, there are many different types of life cover. The whole process of buying life insurance can be confusing with so many options. As a result, we aim to explain it in the most straightforward manner as possible. Term Life Insurance: This type of policy only covers an individual or couple for a set amount of time. It is often taken out by those who may be at a higher risk than others, for example people with families to look after. Decreasing Term Life Insurance: Premiums decrease on a yearly basis. In most cases, they’ll match up with your mortgage repayments. “Whole of Life”: This is probably a bit more expensive than other types. However, the goal of it is to cover you for your entire life. So, you do not have to worry about outliving a normal policy. Convertible: This is a fixed-term policy, but at the end of it you’re given the option to switch to a “whole of life” policy. Over 50s life insurance is an option for those between 50 and 79. In fact, it is guaranteed. What’s more, there is no necessity to undergo medical assessments. You receive cover for the duration of your life, but premiums stop between 85 and 90. Note: There is a “qualifying period” that the last one to two years. Should you pass during this time, beneficiaries will only receive what has been paid into premiums. So just how much life insurance cover do you need? This depends on your circumstances – as with all types of cover. If you are unsure, the best thing to do is to speak to a insurance specialist. There is also the option of using a life insurance calculator which can give you some idea of what you should look for. Consider your outstanding debt this includes how much you owe on your mortgage or other debts you may have. Calculate the amount you pay towards both household income and the needs of your family. Consider how much you can afford to pay for coverage. See what other sources of income your family receives (such as a spouse’s salary). Balance the cover needed with the amount you can afford. Finally, don’t forget that there are joint life insurance policies. Interested? 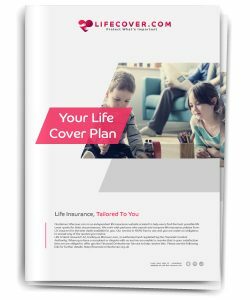 We can help you get covered, just click here to contact us and we will find you the best quote on the market.